I know, I know. 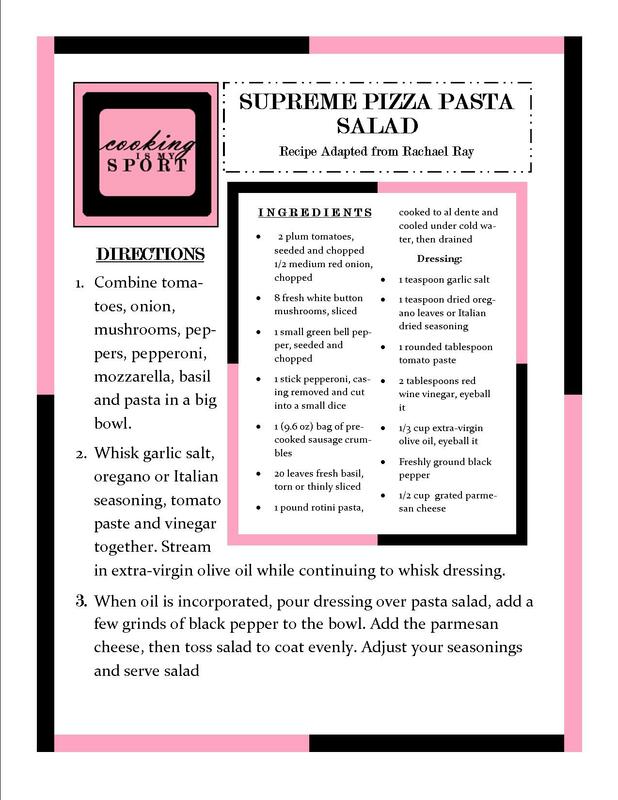 Another ‘pizza’ themed recipe. I’m sure it’s kinda getting to be overkill at this point, right? Well just bear with me one more time. This’ll be the last ‘pizza-style’ recipe I share for a while (at least I THINK it will. I may change my mind about that), and it really was too good NOT to share with you all in the case that you hadn’t heard of it before. Does pizza have a flavor? I don’t mean the individual ingredients themselves, I mean the actual dish of pizza in and of itself- does it have a specific taste and flavor all on it’s own? Then I stick out my bottom lip and kick an imaginary rock because somebody has pizza and they’re not sharing it with me. 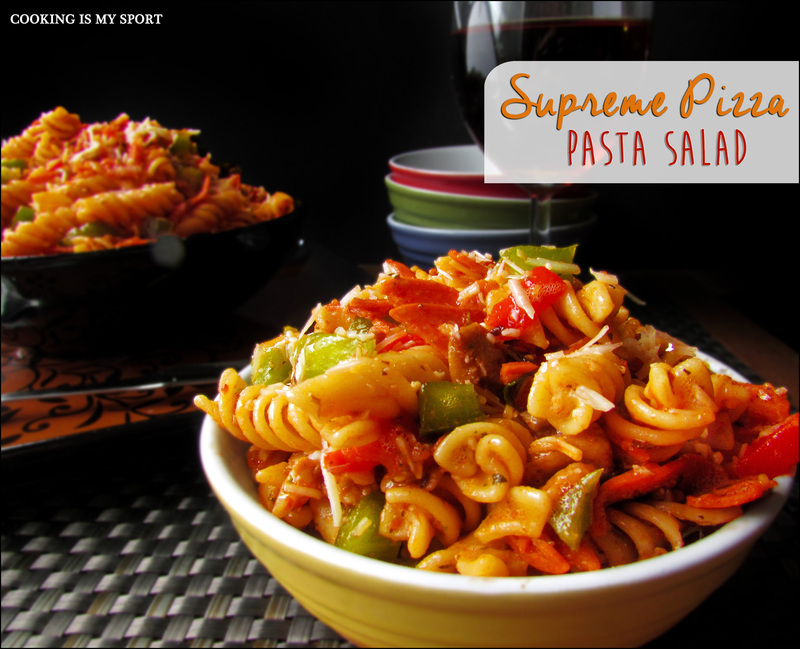 Although the title of this recipe is Supreme Pizza Pasta Salad, I think you should really just adapt it for yourself, and throw whatever you eat on your pizza, into this salad. Supreme Pizza is just what I like, so I used the toppings, plus some roasted red peppers that I roughly chopped up. Well, I kinda take that back. There are some rules that go with this when it comes to add-ins. You have to put pepperoni in this- even if you don’t like it on your pizza. And if you don’t like pepperoni on your pizza, then you’re dead to me. Also, if by some horrible error of your tastebuds in fooling you into believing that you like things like anchovies or black olives on your pizza, then you shouldn’t add them in here either. They’re both disgusting. They’ll ruin the dish. And now, because I’ve run out of things to say and am too lazy to try and think of anything else to discuss: some completely random facts I hunted down just for you guys. 1. 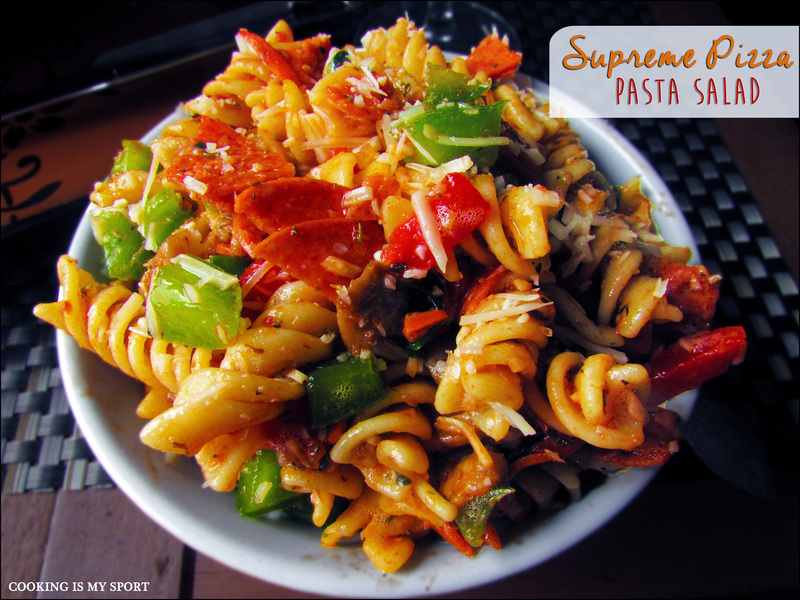 Combine tomatoes, onion, mushrooms, peppers, pepperoni, mozzarella, basil and pasta in a big bowl. 2. Whisk garlic salt, oregano or Italian seasoning, tomato paste and vinegar together. Stream in extra-virgin olive oil while continuing to whisk dressing. 3. When oil is incorporated, pour dressing over pasta salad, add a few grinds of black pepper to the bowl. Add the parmesan cheese, then toss salad to coat evenly. Adjust your seasonings and serve salad. 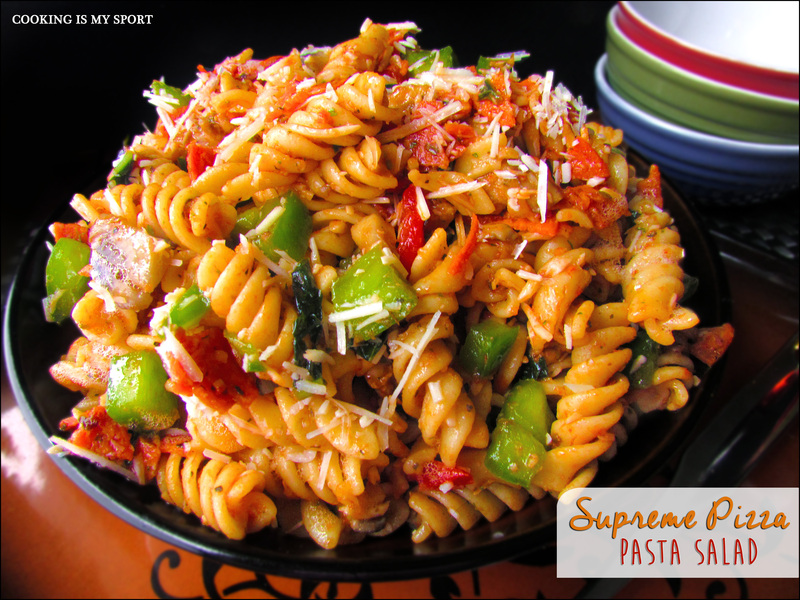 I love the pepperoni in your pasta salad to spice it up! This sounds like a great combination of flavors, I’m definitely going to have to try it out on one of my pasta salads in the future. (It’s my go to lunch). Happy FF, and have a wonderful weekend! Thanks Kaila-I’m normally not a huge pasta salad fan, but this made a believer out of me for sure lol Happy FF! Your pasta looks really appetizing!! LOL, that part about Oprah making $10/sec. I’m going to see The Hundred-Foot Journey tonight, which she co-produced with Spielberg, but she doesn’t really need me to pay for admission, right? No wonder she was always giving stuff away on her show! Yum!! This looks so good! I know, right: pizza and pasta is like a match made in Heaven lol Thank you much! Jess adore your different ways of pizza fusion. …just looks fantastic…. I love anything flavored like pizza, pasta salad with pepperoni and sausage, yum! Brilliant! 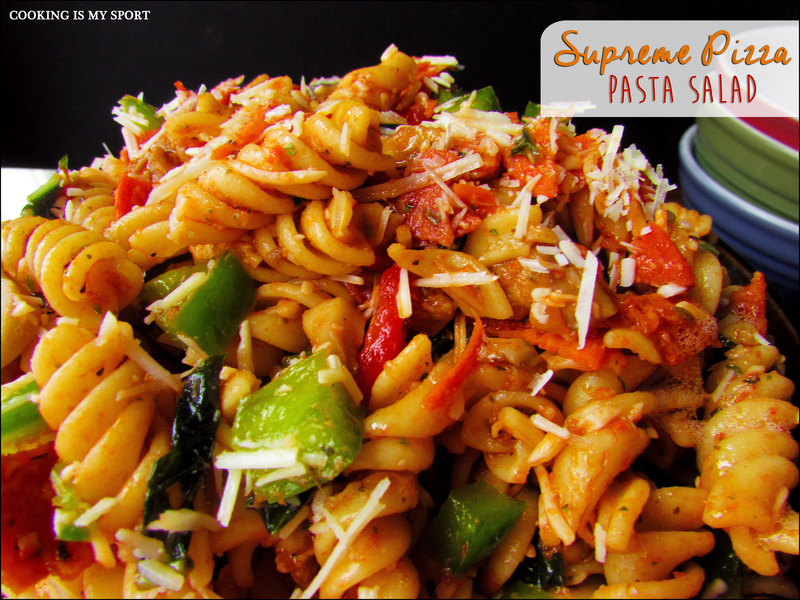 This would be delicious with a piece of grilled naan or flat bread. I respect Oprah. I would love to have that dough but not the problems that come with it. This looks great …making this one! What a great idea this is! Your writing cracks me up, just like you’re sitting right here. Yesterday there was a pizza box in the break room at work and it was just me in there, I wanted to open it up so bad to see if there was anything in there- definitely made my lean cuisine sound super lame- you can’t beat pizza … just can’t.